With the demand to implement the IIoT, the challenge is knowing where to start. Plants generate more data than ever before without meaningful analytics to guide expert decisions and actions. Plantweb enables customers a scalable, easy path into IIoT benefits that will transform data into truly actionable information – information that plant personnel can use to improve the safety, reliability and efficiency of assets, people and processes. Deployable via traditional workstation, tablet or smartphone, Emerson’s Plantweb Insight apps provide specific asset alerts that enable companies to see a quick return on investment in months by avoiding slowdowns and shutdowns. Instead of having to rely on an asset expert, these affordable apps can be quickly deployed and easily accessed anytime, anywhere by maintenance staff to improve asset operations. A user can begin with one or more assets, such as pumps or heat exchangers, and then expand as they achieve measurable benefits. 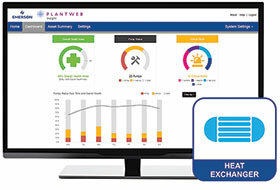 • Heat Exchanger Insight – this Plantweb app provides an overview of heat exchanger status and diagnostics from all the instruments on the network. Based on an algorithm, it provides directions to maintenance on where to focus action for issues, and provides a detail of the issue to guide them in efficient resolution, thereby avoiding slowdowns and shutdowns. • Pressure Relief Device Insight.